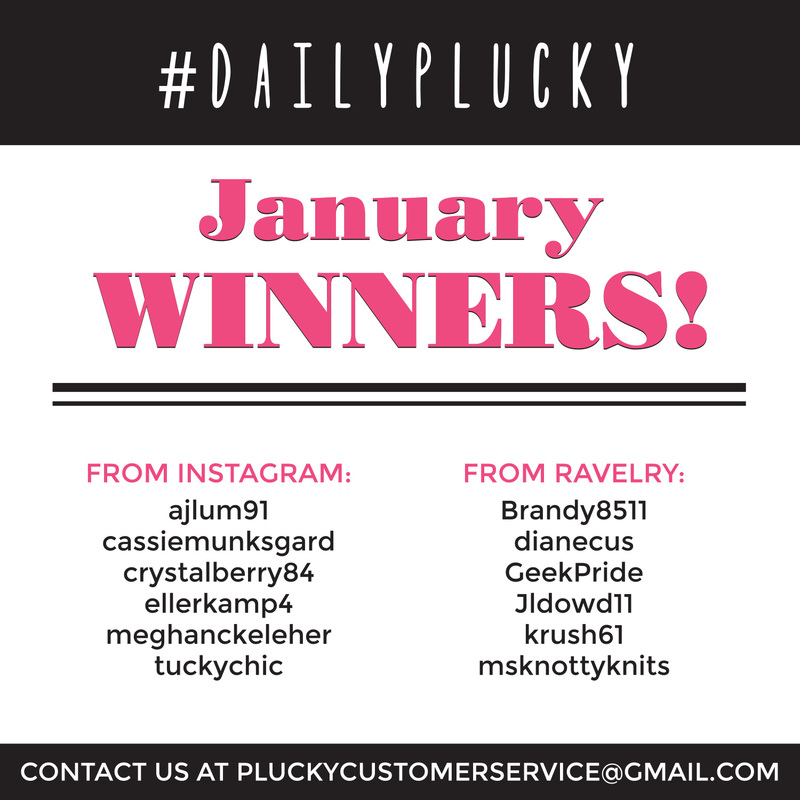 If you are listed as a winner Congrats, and please contact us at customerservice@thepluckyknitter.com with “#dailyplucky January winner” in the subject line and we’ll send you your prize. Congratulations and thank you so much for playing along and inspiring us daily! Need a reminder on how to play along? Visit THIS POST for details on this monthly contest. https://www.thepluckyknitter.com/wp-content/uploads/2017/05/new_small_logo@2x.png 0 0 Sarah https://www.thepluckyknitter.com/wp-content/uploads/2017/05/new_small_logo@2x.png Sarah2019-01-31 17:27:182019-02-01 12:08:16January #dailyplucky Winners! Here are the #pluckyselfiewinners for December 2018!  Thank you so much for playing along! We’ve selected the winners using the Random Number Generator. If your selfie is shown above, please contact us at customerservice@thepluckyknitter.com with “#pluckyselfie December winner” in the subject line and we’ll send you your prize!! It has been such a great year of #pluckyselfie fun and we want to thank you for including us in your days (and nights!). Please keep your eyes peeled for some new and exciting contests in 2019! https://www.thepluckyknitter.com/wp-content/uploads/2017/05/new_small_logo@2x.png 0 0 Sarah https://www.thepluckyknitter.com/wp-content/uploads/2017/05/new_small_logo@2x.png Sarah2019-01-02 13:41:462019-01-02 14:01:46December #pluckyselfie Winners! 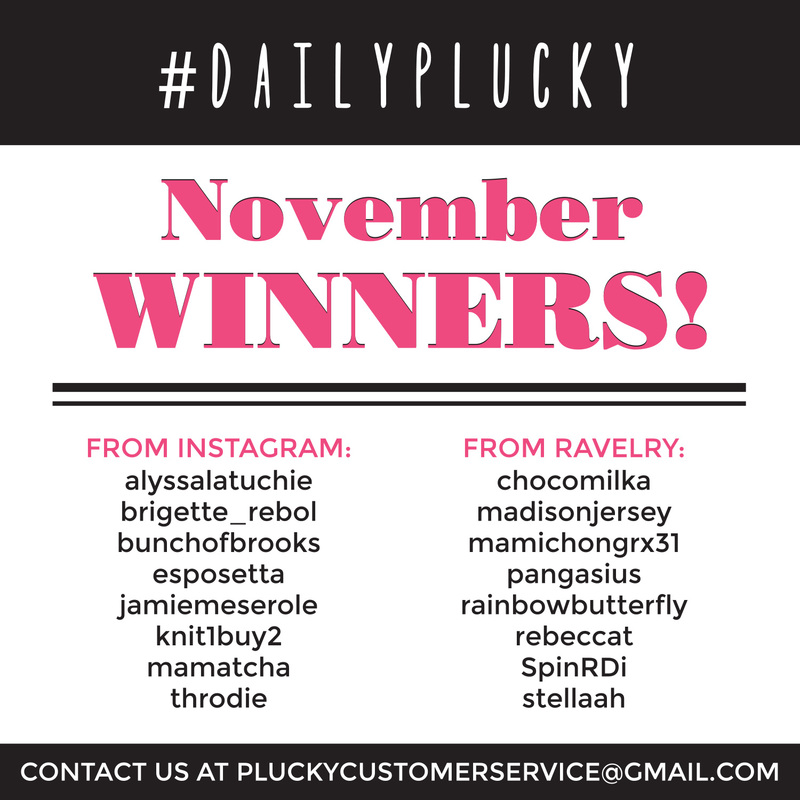 Here are the #pluckyselfie winners for November! Thank you so much for playing along! We’ve selected the winners using the Random Number Generator. If your selfie is above, please contact us at customerservice@thepluckyknitter.com with “#pluckyselfie November winner” in the subject line and we’ll send you your prize. Congrats to the winners and we hope you’ll all continue to join in the #pluckyselfie fun!! For details on how to play along in this monthly contest, please visit THIS POST. https://www.thepluckyknitter.com/wp-content/uploads/2017/05/new_small_logo@2x.png 0 0 Jill Zielinski https://www.thepluckyknitter.com/wp-content/uploads/2017/05/new_small_logo@2x.png Jill Zielinski2018-12-03 14:01:252018-12-03 14:01:32November #pluckyselfie Winners! Here are the #dailyplucky winners for November 2018! Congratulations and thank you so much for playing along and inspiring us daily! 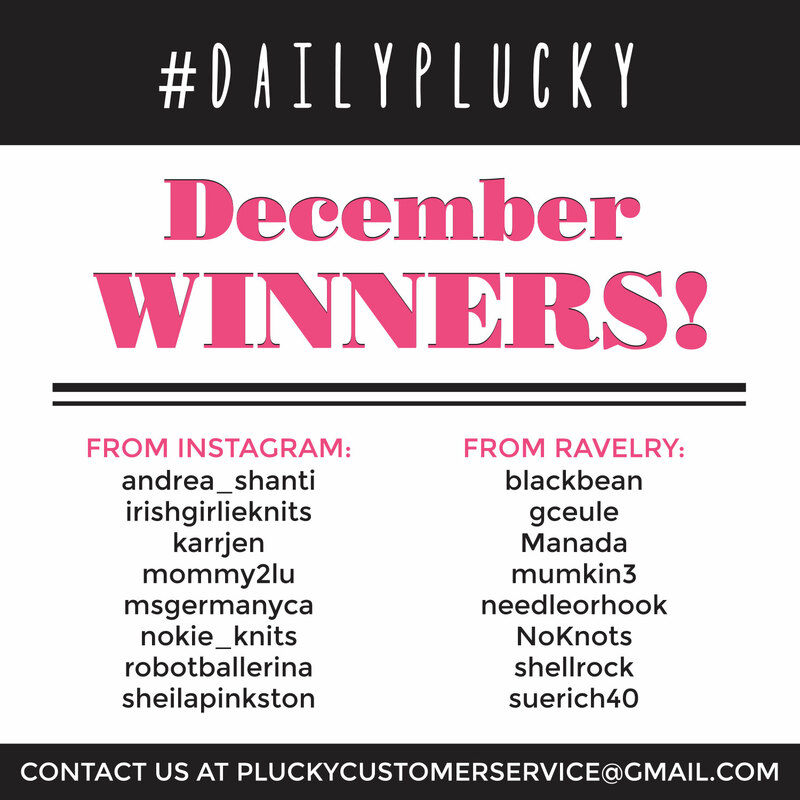 If you are listed as a winner Congrats, and please contact us at customerservice@thepluckyknitter.com with “#dailyplucky November winner” in the subject line and we’ll send you your prize. https://www.thepluckyknitter.com/wp-content/uploads/2017/05/new_small_logo@2x.png 0 0 Sarah https://www.thepluckyknitter.com/wp-content/uploads/2017/05/new_small_logo@2x.png Sarah2018-12-03 13:58:162018-12-03 13:58:23November #dailypluck Winners! Here are the #pluckyselfie winners for October! Thank you so much for playing along! We’ve selected the winners using the Random Number Generator. If your selfie is above, please contact us at customerservice@thepluckyknitter.com with “#pluckyselfie October winner” in the subject line and we’ll send you your prize. Congrats to the winners and we hope you’ll all continue to join in the #pluckyselfie fun!! https://www.thepluckyknitter.com/wp-content/uploads/2017/05/new_small_logo@2x.png 0 0 Sarah https://www.thepluckyknitter.com/wp-content/uploads/2017/05/new_small_logo@2x.png Sarah2018-11-06 12:41:272018-11-08 10:01:45October #pluckyselfie Winners! Here are the #dailyplucky winners for October 2018! Congratulations and thank you so much for playing along and inspiring us daily! 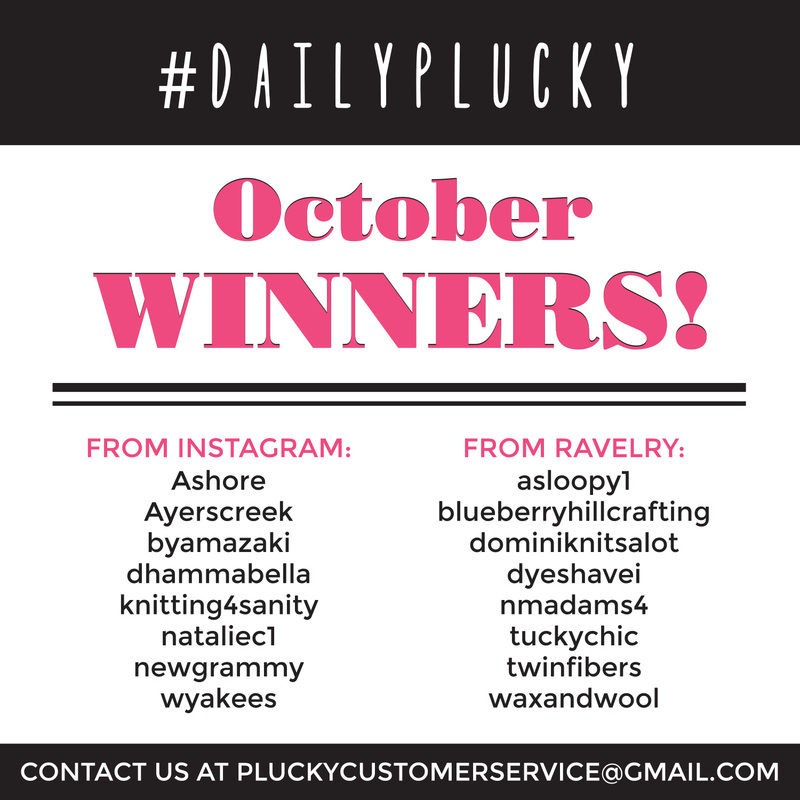 If you are listed as a winner Congrats, and please contact us at customerservice@thepluckyknitter.com with “#dailyplucky October winner” in the subject line and we’ll send you your prize. https://www.thepluckyknitter.com/wp-content/uploads/2017/05/new_small_logo@2x.png 0 0 Sarah https://www.thepluckyknitter.com/wp-content/uploads/2017/05/new_small_logo@2x.png Sarah2018-11-06 12:23:412018-11-06 12:29:13October #dailyplucky Winners! Plucktober 2018 Wrap-Up & Winners! We can not believe it but the calendar says November 1st so that can only mean that another Plucktober has come and gone, time sure flies when you are knitting with friends! We have had so much fun with all of you and your projects have been inspirational! You were terrific leaders, cheerleaders and hand holders! A sweater quantity (6 skeins) of any qualifying base, dyed to the color of your choice! Bases that do not qualify are; Cachet, Cashmere, Groovy, Groovy Baby, Halo, Halo Worsted, Lusso, Phoebe or Galore. If you are listed above as a winner, Congratulations! Please contact customerservice@thepluckyknitter.com with “Plucktober Prize #1 Winner” in the subject line and we can get you your prize ASAP! 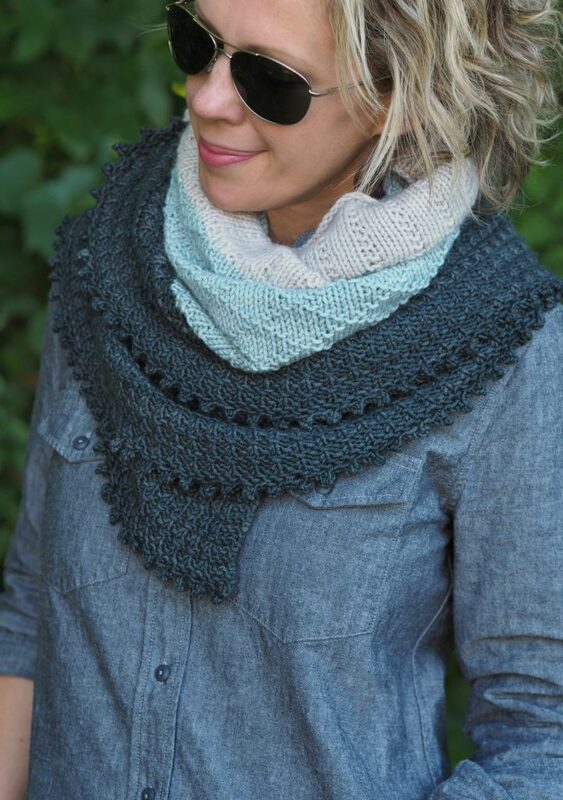 A Snug Worsted mystery kit to make the Wasp Nest shawl, pattern included! If you are listed above as a winner, Congratulations! Please contact customerservice@thepluckyknitter.com with “Plucktober Prize #2 Winner” in the subject line and we can get you your prize ASAP! A mystery swag item, plus a mystery skein of Cormo to make a Crosstown Hat, pattern & flax fur pom pom included! If you are listed above as a winner, Congratulations! Please contact customerservice@thepluckyknitter.com with “Plucktober Prize #3 Winner” in the subject line and we can get you your prize ASAP! We hope you had fun and whether you finished every task you set for yourself on Plucktober 1st or not, it has been great fun knitting with you all! https://www.thepluckyknitter.com/wp-content/uploads/2017/05/new_small_logo@2x.png 0 0 Sarah https://www.thepluckyknitter.com/wp-content/uploads/2017/05/new_small_logo@2x.png Sarah2018-10-31 10:25:222018-11-01 15:34:58Plucktober 2018 Wrap-Up & Winners! Here are the #dailyplucky winners for September 2018! Congratulations and thank you so much for playing along and inspiring us daily! 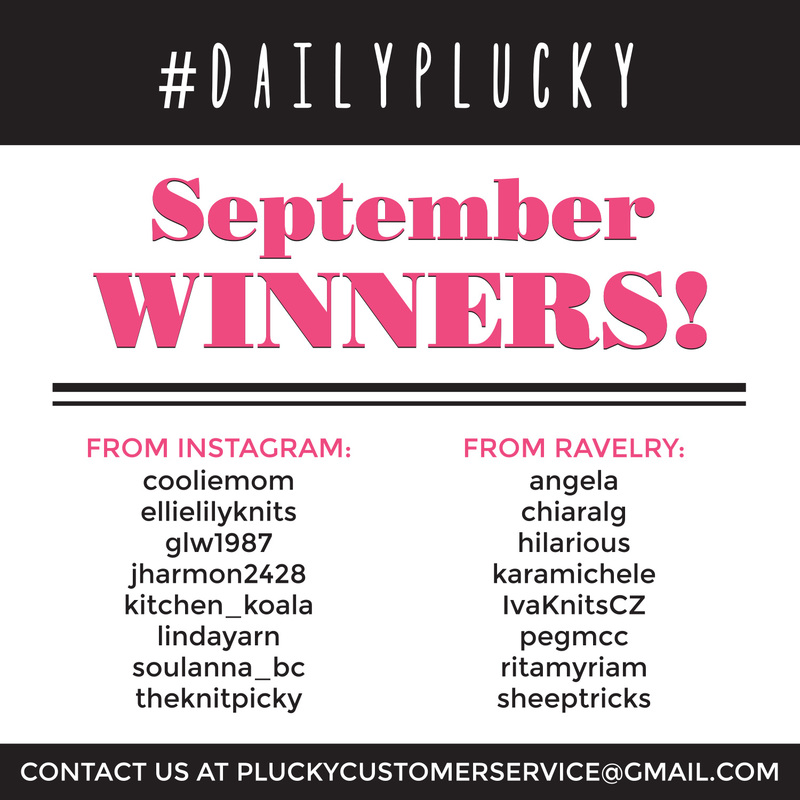 If you are listed as a winner Congrats, and please contact us at customerservice@thepluckyknitter.com with “#dailyplucky September winner” in the subject line and we’ll send you your prize. https://www.thepluckyknitter.com/wp-content/uploads/2017/05/new_small_logo@2x.png 0 0 Sarah https://www.thepluckyknitter.com/wp-content/uploads/2017/05/new_small_logo@2x.png Sarah2018-10-02 10:30:392018-10-02 10:38:40September #dailyplucky Winners! Here are the #pluckyselfie winners for September! Thank you so much for playing along! We’ve selected the winners using the Random Number Generator. If your selfie is above, please contact us at customerservice@thepluckyknitter.com with “#pluckyselfie September winner” in the subject line and we’ll send you your prize. Congrats to the winners and we hope you’ll all continue to join in the #pluckyselfie fun!! https://www.thepluckyknitter.com/wp-content/uploads/2017/05/new_small_logo@2x.png 0 0 Sarah https://www.thepluckyknitter.com/wp-content/uploads/2017/05/new_small_logo@2x.png Sarah2018-10-02 10:01:562018-10-02 10:03:31September #pluckyselfie Winners! Here are the #dailyplucky winners for August 2018! Congratulations and thank you so much for playing along and inspiring us daily! 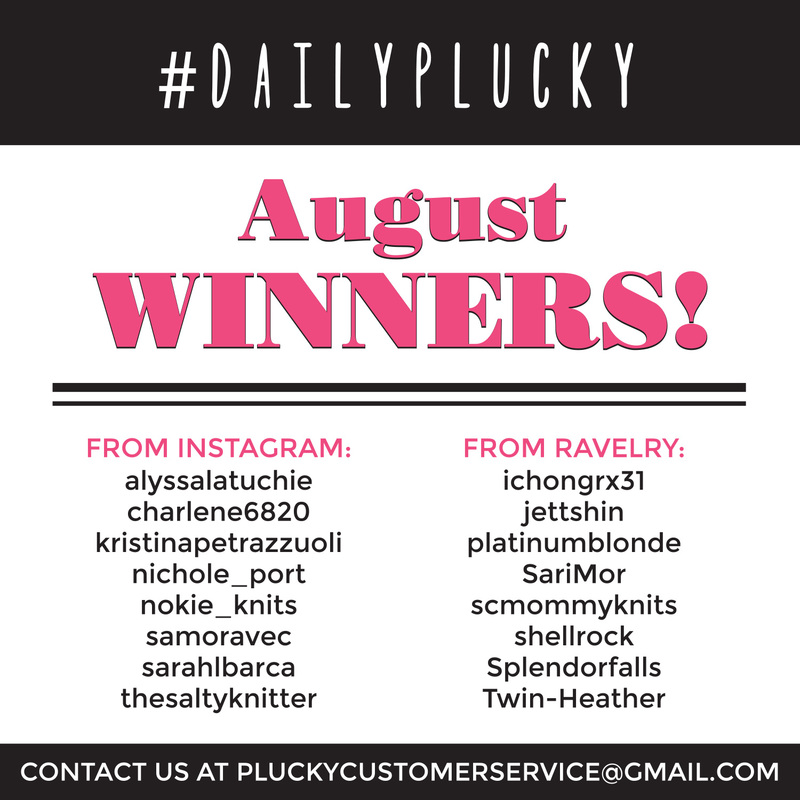 If you are listed as a winner Congrats, and please contact us at customerservice@thepluckyknitter.com with “#dailyplucky August winner” in the subject line and we’ll send you your prize. https://www.thepluckyknitter.com/wp-content/uploads/2017/05/new_small_logo@2x.png 0 0 Sarah https://www.thepluckyknitter.com/wp-content/uploads/2017/05/new_small_logo@2x.png Sarah2018-09-06 08:26:092018-09-06 08:38:00August #dailyplucky Winners! 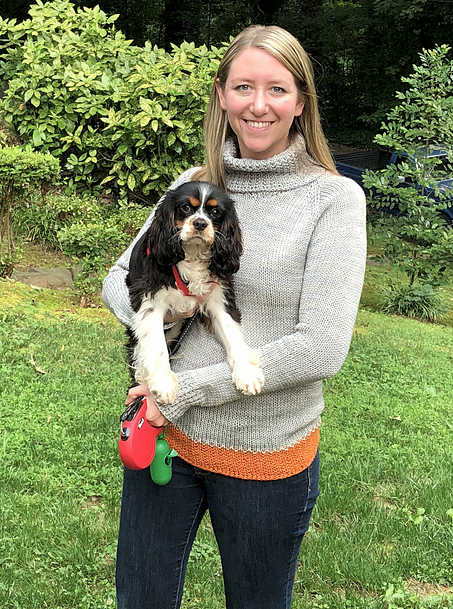 How wonderful to see all of your fabulous Dog Walker sweaters! We certainly loved to see all the excitement from this KAL and can’t wait for the next one (stay tuned!). 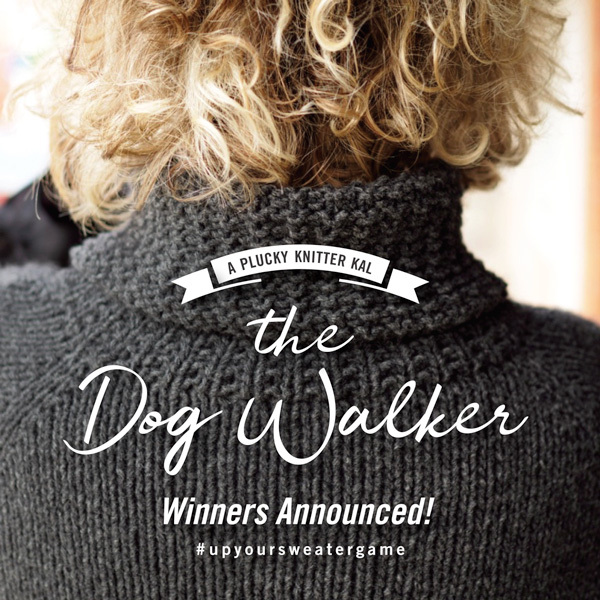 Without further ado, we are announcing the winners of the Dog Walker KAL. The two grand prize winners are Librasong and knit.love.soul. Congratulations!!! You each have won a 6 skein quantity of Yakkity DK or Beauregard Aran dyed in the color of your choice, or Yakpaca. The winner for Best In Show goes to EllenSellsNJ (on Ravelry). Congrats Ellen! We have something special coming to you too! Here are the #pluckyselfie winners for July! Thank you so much for playing along! We’ve randomly selected the winners using the Random Number Generator. 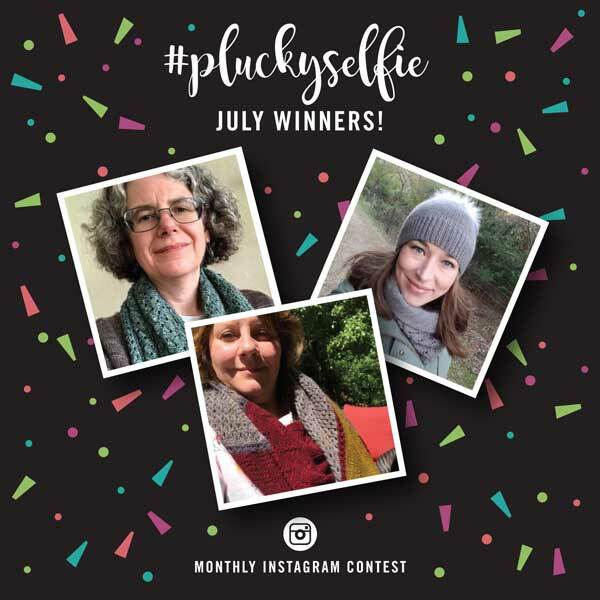 If your selfie is above, please contact us at customerservice@thepluckyknitter.com with “#pluckyselfie July winner” in the subject line and we’ll send you your prize. Congrats to the winners and we hope you’ll all continue to join in the #pluckyselfie fun!! https://www.thepluckyknitter.com/wp-content/uploads/2017/05/new_small_logo@2x.png 0 0 Sarah https://www.thepluckyknitter.com/wp-content/uploads/2017/05/new_small_logo@2x.png Sarah2018-08-01 10:24:142018-08-01 10:27:11July #pluckyselfie Winners! Here are the #dailyplucky winners for July 2018! Congratulations and thank you so much for playing along and inspiring us daily! If you are listed as a winner Congrats, and please contact us at customerservice@thepluckyknitter.com with “#dailyplucky July winner” in the subject line and we’ll send you your prize. https://www.thepluckyknitter.com/wp-content/uploads/2017/05/new_small_logo@2x.png 0 0 Sarah https://www.thepluckyknitter.com/wp-content/uploads/2017/05/new_small_logo@2x.png Sarah2018-08-01 10:11:422018-08-01 10:27:17July #dailyplucky Winners! Here are the #pluckyselfie winners for June! Thank you so much for playing along! We’ve randomly selected the winners using the Random Number Generator. If your selfie is above, please contact us at customerservice@thepluckyknitter.com with “#pluckyselfie June winner” in the subject line and we’ll send you your prize. Congrats to the winners and we hope you’ll all continue to join in the #pluckyselfie fun!! https://www.thepluckyknitter.com/wp-content/uploads/2017/05/new_small_logo@2x.png 0 0 Sarah https://www.thepluckyknitter.com/wp-content/uploads/2017/05/new_small_logo@2x.png Sarah2018-07-02 09:49:552018-07-02 09:50:33June #pluckyselfie Winners! Here are the #dailyplucky winners for June 2018! Congratulations and thank you so much for playing along and inspiring us daily! 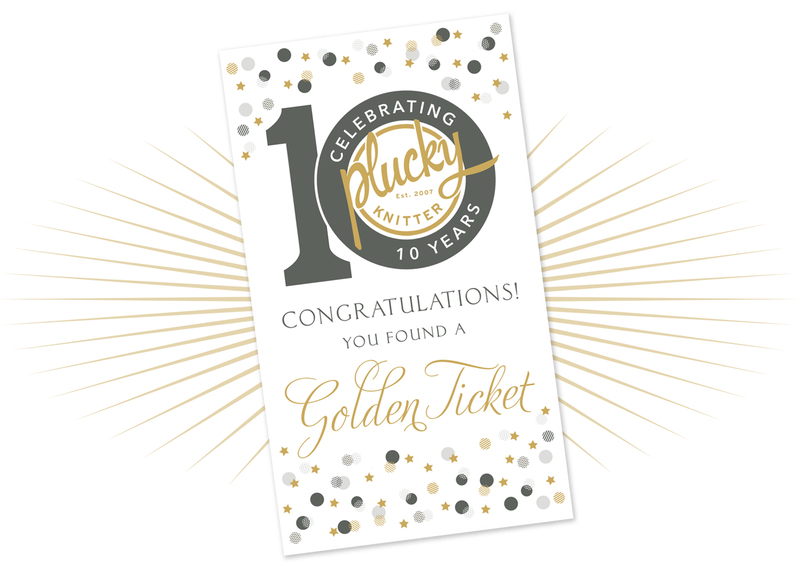 If you are listed as a winner Congrats, and please contact us at customerservice@thepluckyknitter.com with “#dailyplucky June winner” in the subject line and we’ll send you your prize. https://www.thepluckyknitter.com/wp-content/uploads/2017/05/new_small_logo@2x.png 0 0 Sarah https://www.thepluckyknitter.com/wp-content/uploads/2017/05/new_small_logo@2x.png Sarah2018-07-02 09:31:492018-07-02 09:31:58June #dailyplucky Winners! Here are the #pluckyselfie winners for May! Thank you so much for playing along! We’ve randomly selected the winners using the Random Number Generator. If your selfie is above, please contact us at customerservice@thepluckyknitter.com with “#pluckyselfie May winner” in the subject line and we’ll send you your prize. Congrats to the winners and we hope you’ll all continue to join in the #pluckyselfie fun!! https://www.thepluckyknitter.com/wp-content/uploads/2017/05/new_small_logo@2x.png 0 0 Sarah https://www.thepluckyknitter.com/wp-content/uploads/2017/05/new_small_logo@2x.png Sarah2018-06-04 13:23:462018-06-04 13:25:09May #pluckyselfie Winners! Here are the #pluckyselfie winners for April! Thank you so much for playing along! We’ve randomly selected the winners using the Random Number Generator. 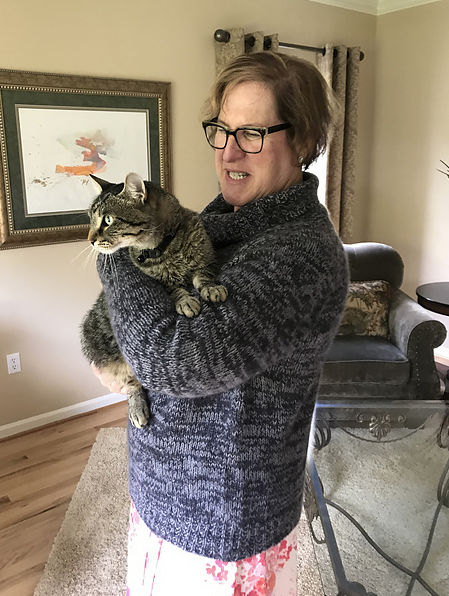 If your selfie is above, please contact us at customerservice@thepluckyknitter.com with “#pluckyselfie April winner” in the subject line and we’ll send you your prize. Congrats to the winners and we hope you’ll all continue to join in the #pluckyselfie fun!! https://www.thepluckyknitter.com/wp-content/uploads/2017/05/new_small_logo@2x.png 0 0 Sarah https://www.thepluckyknitter.com/wp-content/uploads/2017/05/new_small_logo@2x.png Sarah2018-05-03 12:39:162018-05-03 12:39:23April #pluckyselfie Winners! Here are the #dailyplucky winners for April 2018! Congratulations and thank you so much for playing along and inspiring us daily! 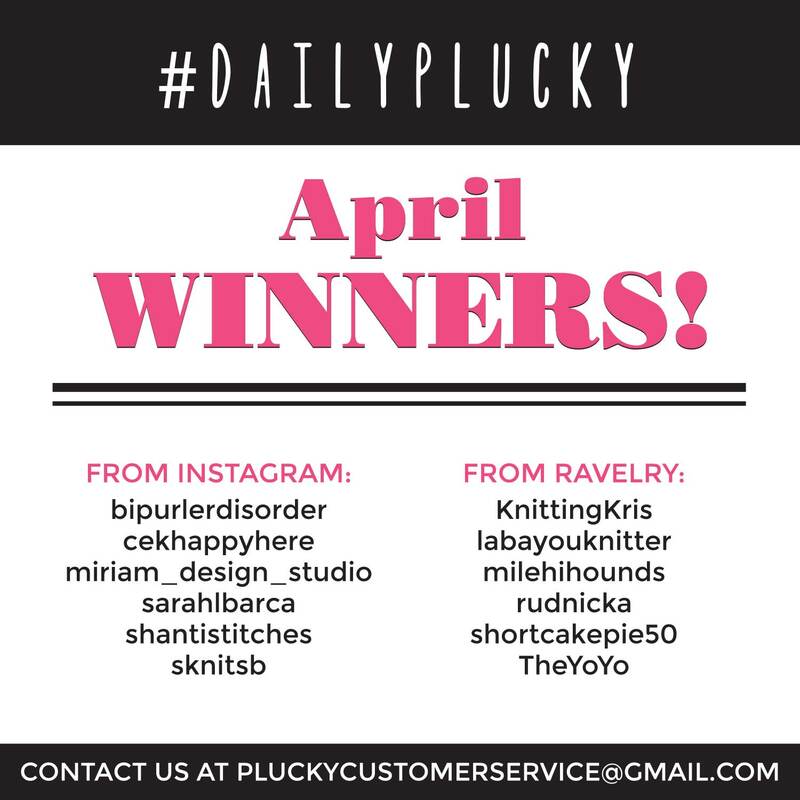 If you are listed as a winner Congrats, and please contact us at customerservice@thepluckyknitter.com with “#dailyplucky April winner” in the subject line and we’ll send you your prize. https://www.thepluckyknitter.com/wp-content/uploads/2017/05/new_small_logo@2x.png 0 0 Sarah https://www.thepluckyknitter.com/wp-content/uploads/2017/05/new_small_logo@2x.png Sarah2018-05-03 12:38:152018-05-03 12:43:23April #dailyplucky Winners! Thank you for all of the celebratory wishes and entries into our 40K Celebration Giveaway! We’ve used the Random Number Generator and selected 2 winners. 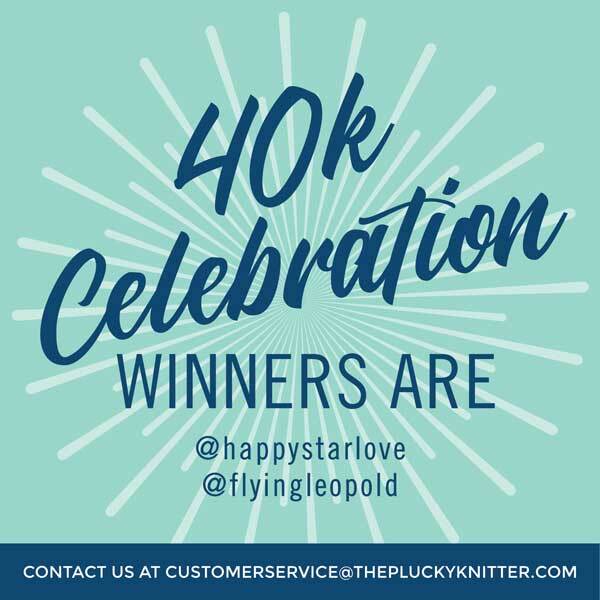 If you see your Instagram name above, please send us an email to:customerservice@thepluckyknitter.com with “40K Celebration Winner” in the subject line. We’ll get your winnings out asap! https://www.thepluckyknitter.com/wp-content/uploads/2017/05/new_small_logo@2x.png 0 0 Sarah https://www.thepluckyknitter.com/wp-content/uploads/2017/05/new_small_logo@2x.png Sarah2018-04-16 14:16:422018-05-03 12:39:4140k Celebration Winners! 40k Celebration Giveaway – Contest Time! Starting today and ending Sunday, April 15th at 11:59 pm EDT, leave a comment on our Instagram post (that you can find HERE), on this post (you must also follow us on IG) and tag 2 friends. We will use the Random Number Generator to pick 2 winners to win one of these sets!! https://www.thepluckyknitter.com/wp-content/uploads/2017/05/new_small_logo@2x.png 0 0 Sarah https://www.thepluckyknitter.com/wp-content/uploads/2017/05/new_small_logo@2x.png Sarah2018-04-13 12:17:142018-04-13 12:27:2340k Celebration Giveaway - Contest Time! 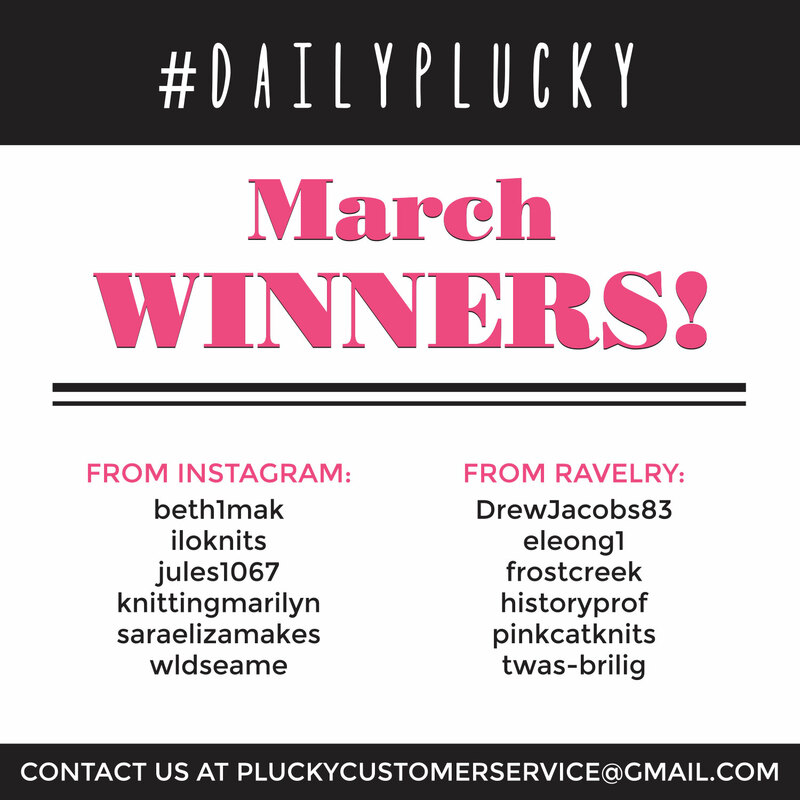 Here are the #pluckyselfie winners for March! Thank you so much for playing along! We’ve randomly selected the winners using the Random Number Generator. If your selfie is above, please contact us at customerservice@thepluckyknitter.com with “#pluckyselfie February winner” in the subject line and we’ll send you your prize. Congrats to the winners and we hope you’ll all continue to join in the #pluckyselfie fun!! https://www.thepluckyknitter.com/wp-content/uploads/2017/05/new_small_logo@2x.png 0 0 Sarah https://www.thepluckyknitter.com/wp-content/uploads/2017/05/new_small_logo@2x.png Sarah2018-03-30 10:31:462018-04-09 09:19:02March #pluckyselfie Winners! Here are the #dailyplucky winners for March 2018! Congratulations and thank you so much for playing along and inspiring us daily! https://www.thepluckyknitter.com/wp-content/uploads/2017/05/new_small_logo@2x.png 0 0 Sarah https://www.thepluckyknitter.com/wp-content/uploads/2017/05/new_small_logo@2x.png Sarah2018-03-30 10:30:012018-03-31 12:08:19March #dailyplucky Winners! 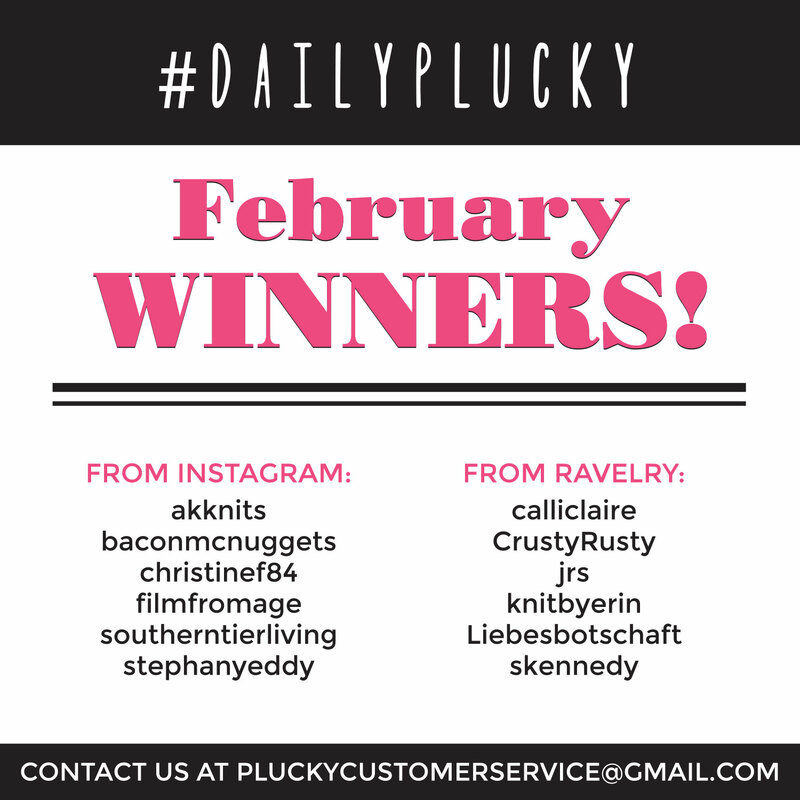 Here are the #pluckyselfie winners for February! Thank you so much for playing along! We’ve randomly selected the winners using the Random Number Generator. If your selfie is above, please contact us at customerservice@thepluckyknitter.com with “#pluckyselfie February winner” in the subject line and we’ll send you your prize. Congrats to the winners and we hope you’ll all continue to join in the #pluckyselfie fun!! https://www.thepluckyknitter.com/wp-content/uploads/2017/05/new_small_logo@2x.png 0 0 Sarah https://www.thepluckyknitter.com/wp-content/uploads/2017/05/new_small_logo@2x.png Sarah2018-03-01 13:08:102018-04-09 09:18:42February #pluckyselfie Winners! Here are the #dailyplucky winners for February 2018! Congratulations and thank you so much for playing along and inspiring us daily! https://www.thepluckyknitter.com/wp-content/uploads/2017/05/new_small_logo@2x.png 0 0 Sarah https://www.thepluckyknitter.com/wp-content/uploads/2017/05/new_small_logo@2x.png Sarah2018-03-01 12:59:062018-03-01 12:59:14February #dailyplucky Winners! Well, that was a ton of fun!!! We have returned home full of ideas and inspiration and more than our share of smiley (and oh so tired) faces, funny stories and happy hearts just bursting with gratitude! Now it’s getting all our ducks in a row, shipping those OHW’s and mystery kits (Crevasse mystery kits coming up) and lining up what we have in store for you in March and …. https://www.thepluckyknitter.com/wp-content/uploads/2017/05/new_small_logo@2x.png 0 0 Sarah https://www.thepluckyknitter.com/wp-content/uploads/2017/05/new_small_logo@2x.png Sarah2018-02-27 12:25:242018-02-28 11:50:55Thank You Stitches West! 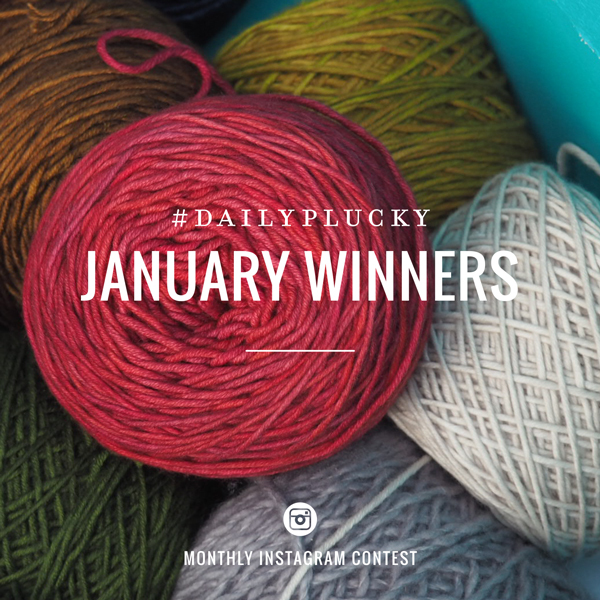 Here are the #dailyplucky winners for January 2018! Congratulations and thank you so much for playing along and inspiring us daily! https://www.thepluckyknitter.com/wp-content/uploads/2017/05/new_small_logo@2x.png 0 0 Sarah https://www.thepluckyknitter.com/wp-content/uploads/2017/05/new_small_logo@2x.png Sarah2018-02-02 11:15:452018-02-02 11:16:03January #dailyplucky Winners! It’s so fun to see all of the #pluckyselfie posts for January! Thank you so much for playing along! We’ve randomly selected the winners and they are shown here. If your selfie is above, please contact us at customerservice@thepluckyknitter.com with “#pluckyselfie January winner” in the subject line and we’ll send you your prize. 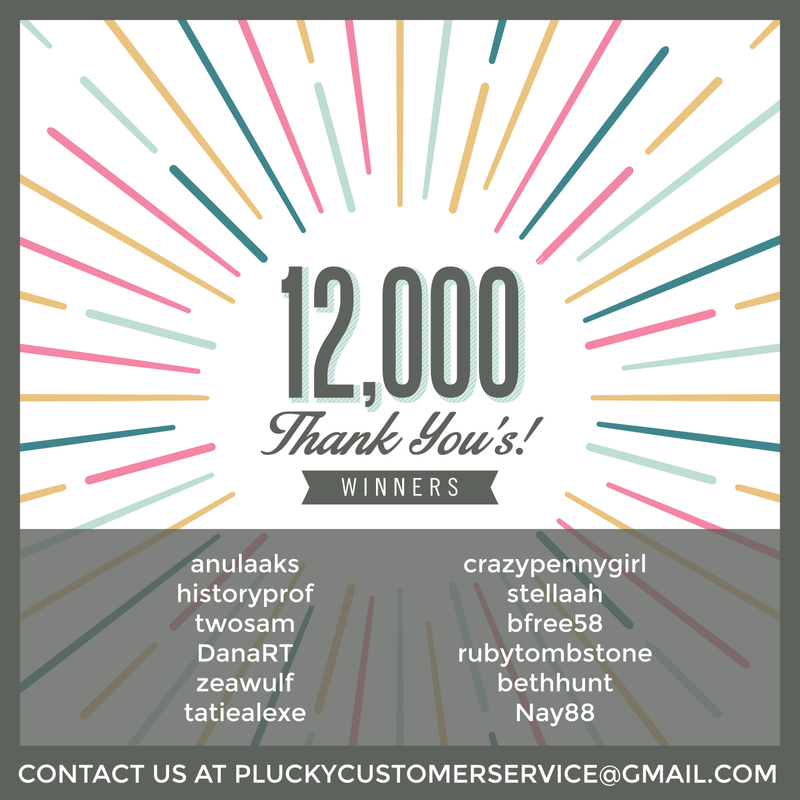 Congrats to the winners and we hope you’ll all continue to join in the #pluckyselfie fun!! https://www.thepluckyknitter.com/wp-content/uploads/2017/05/new_small_logo@2x.png 0 0 Sarah https://www.thepluckyknitter.com/wp-content/uploads/2017/05/new_small_logo@2x.png Sarah2018-02-02 11:13:292018-04-09 09:18:21January #pluckyselfie Winners! Here are the #dailyplucky winners for December 2017! Congratulations and thank you so much for playing along and inspiring us daily! https://www.thepluckyknitter.com/wp-content/uploads/2017/05/new_small_logo@2x.png 0 0 Sarah https://www.thepluckyknitter.com/wp-content/uploads/2017/05/new_small_logo@2x.png Sarah2018-01-02 13:03:102018-01-02 13:03:18December #dailyplucky Winners! Whether we would like to admit it or not, at one time or another we have all taken one, right?? Well, we thought it would be fun to step up our selfie game a notch or two…introducing, #pluckyselfie!!! We are pleased to present to you #pluckyselfie, our brand new social media contest for 2018! Wondering how to enter? No worries, it’s easy peasy! There are loads of options for a #pluckyselfie and here are a just a few of our favorites: strike a pose in your Plucky swag or with some new skeins that have just landed in your stash, or, maybe you have a sweater on the needles that you’re trying on as you go, be sure to share, and of course, we must see all of your gorgeous new FO’s! Whatever you choose, tag it with the hashtag #pluckyselfie, then, at the end of each month we will select 6 winners. On the first of every month, we will post the winners on our Instagram feed, so if you are not already, now is the time to follow! If you are a chosen winner, you will receive a skein of Plucky yarn. So, don’t be shy! We can’t wait to see your #pluckyselfie’s!! Here are the #dailyplucky winners for October 2017! Congratulations and thank you so much for playing along and inspiring us daily! https://www.thepluckyknitter.com/wp-content/uploads/2017/05/new_small_logo@2x.png 0 0 Sarah https://www.thepluckyknitter.com/wp-content/uploads/2017/05/new_small_logo@2x.png Sarah2017-11-02 12:48:112017-11-02 12:48:42October #dailyplucky Winners! Here are the #dailyplucky winners for September 2017! Congratulations and thank you so much for playing along and inspiring us daily! https://www.thepluckyknitter.com/wp-content/uploads/2017/05/new_small_logo@2x.png 0 0 Sarah https://www.thepluckyknitter.com/wp-content/uploads/2017/05/new_small_logo@2x.png Sarah2017-10-02 09:20:392017-10-02 09:20:48September #dailypluck Winners! Here are the #dailyplucky winners for August 2017! Congratulations and thank you so much for playing along and inspiring us daily! https://www.thepluckyknitter.com/wp-content/uploads/2017/05/new_small_logo@2x.png 0 0 Sarah https://www.thepluckyknitter.com/wp-content/uploads/2017/05/new_small_logo@2x.png Sarah2017-09-01 09:19:282017-09-01 09:19:36August #dailyplucky Winners! Here are the #dailyplucky winners for July 2017! Congratulations and thank you so much for playing along and inspiring us daily! https://www.thepluckyknitter.com/wp-content/uploads/2017/05/new_small_logo@2x.png 0 0 Sarah https://www.thepluckyknitter.com/wp-content/uploads/2017/05/new_small_logo@2x.png Sarah2017-08-02 09:01:512017-08-02 09:02:03July #dailyplucky Winners! Do you have a Plucky Wish? A color and base combination that has been living only in your dreams? 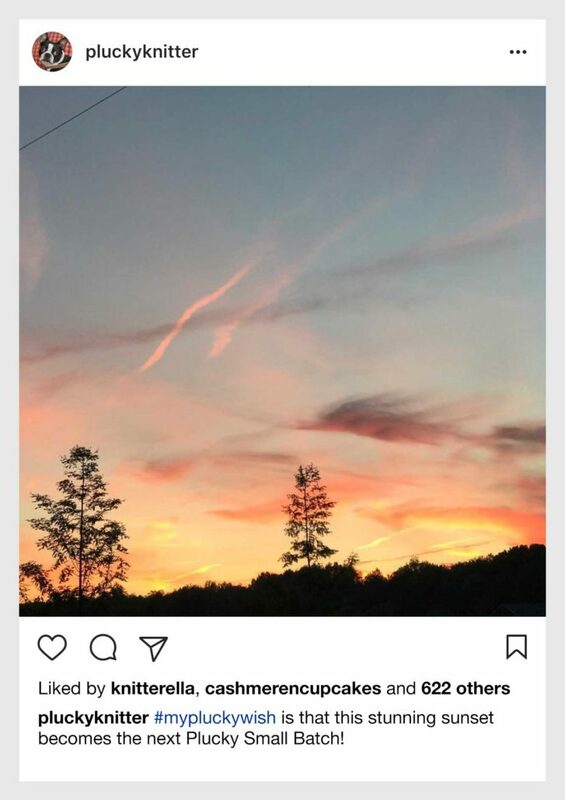 Maybe it’s inspired by something you’ve seen or captured in nature, or maybe it’s based on an old favorite article of clothing. Or even favorite food or drink! Whatever inspires your wish, we would love to hear it!! How will we know what your wish is? It’s easy peasy! First, follow us on Instagram, then post an inspiration photo to Instagram with the hashtag #mypluckywish. If your entry is chosen as a limited edition colorway we will tag you on Instagram AND send you a skein of your wished for colorway for your very own! It couldn’t be more simple, or FUN!!! Let the wishing begin! Here are the #dailyplucky winners for June 2017! Congratulations and thank you so much for playing along and inspiring us daily! https://www.thepluckyknitter.com/wp-content/uploads/2017/05/new_small_logo@2x.png 0 0 Sarah https://www.thepluckyknitter.com/wp-content/uploads/2017/05/new_small_logo@2x.png Sarah2017-07-01 09:50:562017-07-01 09:51:07June #dailyplucky Winners! Here are the #dailyplucky winners for April 2017! Congratulations and thank you so much for playing along and inspiring us daily! Thank YOU, so much, to every one of you who participated in our contest! We had so much fun reading about your favorites and loved your kind comments. We sincerely appreciate each & every one of our dear members and Plucky friends! We’ve chosen 12 winners from the Ravelry thread and have a special something to send your way! If you see your Ravelry username listed in the graphic, be sure to email us at mailto:pluckycustomerservice@gmail.com with your name and mailing address so we can have your special “thank you” on its way! WOW! 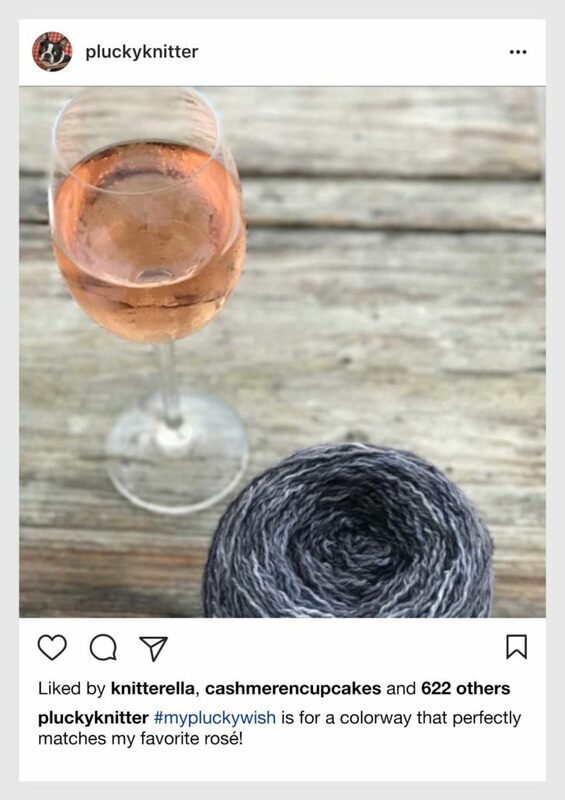 We’ve reached 12,000 members in the Plucky Ravelry group and I would like to thank each and every one of you for your interest, enthusiasm and interaction with us. We couldn’t do it without you and know I speak for the entire Plucky Crew in expressing our sincere gratitude. 12,000 members is quite a milestone. Let’s celebrate with a contest, shall we?! • Your favorite Plucky Base. • Your favorite Plucky Color. • Your favorite Plucky Project. • Your favorite Plucky Pattern. We are looking forward to your entries and reading what you have to say. This will be so much fun! Contest runs now through Saturday, April 8th, 2017. Winners will be drawn at random and we will post them on Monday, April 10th. 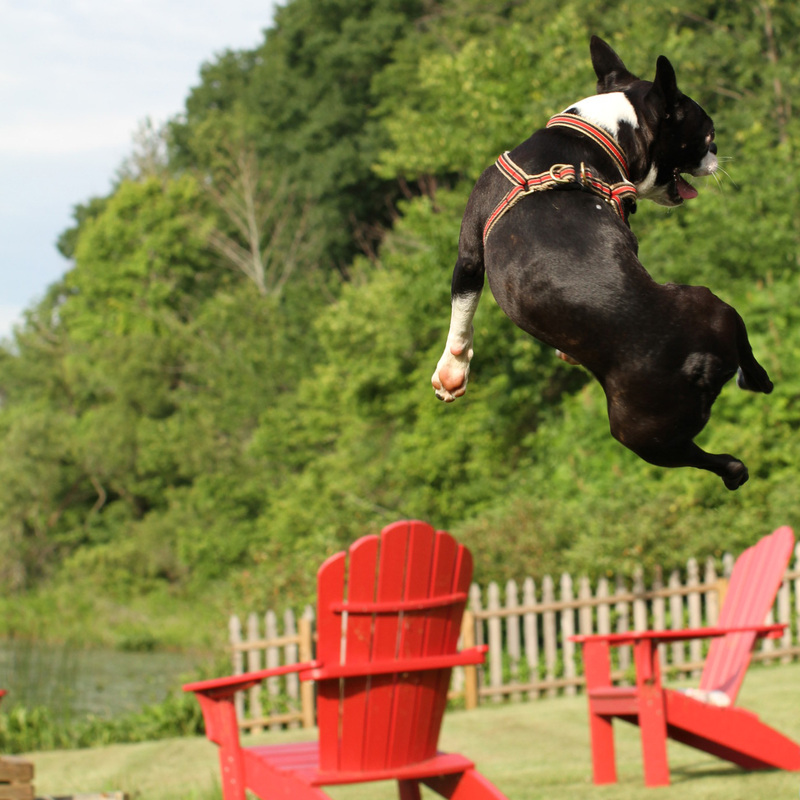 By the way, Ox is really excited about this, too! https://www.thepluckyknitter.com/wp-content/uploads/2017/05/new_small_logo@2x.png 0 0 Sarah https://www.thepluckyknitter.com/wp-content/uploads/2017/05/new_small_logo@2x.png Sarah2017-04-05 09:55:182017-04-05 11:00:3712,000 Thank You's! Here are the #dailyplucky winners for March 2017! Congratulations and thank you so much for playing along and inspiring us daily! https://www.thepluckyknitter.com/wp-content/uploads/2017/05/new_small_logo@2x.png 0 0 Sarah https://www.thepluckyknitter.com/wp-content/uploads/2017/05/new_small_logo@2x.png Sarah2017-04-01 12:37:392017-04-01 12:37:51March #dailyplucky Winners! Here are the #dailyplucky winners for February 2017! Congratulations and thank you so much for playing along and inspiring us daily! https://www.thepluckyknitter.com/wp-content/uploads/2017/05/new_small_logo@2x.png 0 0 Sarah https://www.thepluckyknitter.com/wp-content/uploads/2017/05/new_small_logo@2x.png Sarah2017-03-01 09:19:072017-03-01 09:19:27February #dailyplucky Winners! Here are the first #dailyplucky winners of 2017! Congratulations and thank you so much for playing along and inspiring us daily! https://www.thepluckyknitter.com/wp-content/uploads/2017/05/new_small_logo@2x.png 0 0 Sarah https://www.thepluckyknitter.com/wp-content/uploads/2017/05/new_small_logo@2x.png Sarah2017-02-01 07:33:142017-02-01 07:33:25January #dailyplucky Winners! Here are the last of our #dailyplucky winners from 2016! Congratulations and thank you so much for playing along and inspiring us daily! https://www.thepluckyknitter.com/wp-content/uploads/2017/05/new_small_logo@2x.png 0 0 Sarah https://www.thepluckyknitter.com/wp-content/uploads/2017/05/new_small_logo@2x.png Sarah2017-01-03 08:13:032017-01-03 08:15:20December #dailyplucky Winners! https://www.thepluckyknitter.com/wp-content/uploads/2017/05/new_small_logo@2x.png 0 0 Sarah https://www.thepluckyknitter.com/wp-content/uploads/2017/05/new_small_logo@2x.png Sarah2016-11-04 14:51:262016-11-04 14:51:37October #dailyplucky Winners! https://www.thepluckyknitter.com/wp-content/uploads/2017/05/new_small_logo@2x.png 0 0 Jill Zielinski https://www.thepluckyknitter.com/wp-content/uploads/2017/05/new_small_logo@2x.png Jill Zielinski2016-10-01 13:36:322016-10-01 13:36:32September #dailyplucky Winners! Here are our #dailyplucky winners for August! Congratulations and thank you so much for playing along and inspiring us daily! https://www.thepluckyknitter.com/wp-content/uploads/2017/05/new_small_logo@2x.png 0 0 Sarah https://www.thepluckyknitter.com/wp-content/uploads/2017/05/new_small_logo@2x.png Sarah2016-09-01 08:20:022016-09-01 08:22:07#dailyplucky August Winners! The question every knitter agonizes over…. what knitting to bring on a trip? How about The Stateline KAL! While the rest of this week is filled with shipping, dyeing and all other things Plucky, by the time the first of the week rolls around Bob and I will have packed up the car and headed out for a little (ok a lot of) multitasking road trip. And, because we don’t do things in small doses, this trip will cover a couple thousand miles, include our cameras and bear repellent, some road trip knitting and all things trunk show related (among other to-do’s on our list!) as we make our way to Jackson Hole, Wyoming. 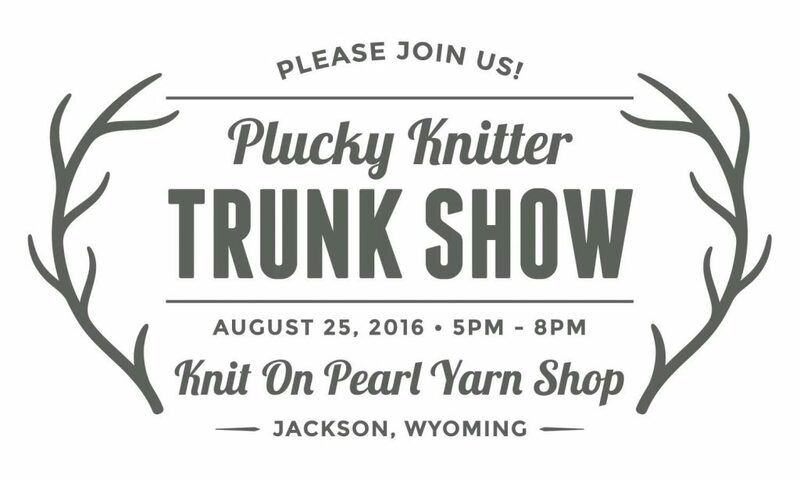 On August 25th, if you’re in the neighborhood, please join Hayley and I at Knit on Pearl (145 W Gill Ave, Jackson, WY) from 5:00 p.m. to 8:00 p.m. as we knit a little, chat a lot and help you in any way we can! But, we can’t have a road trip without a travel project! Bob usually handles most of the driving chores, leaving me to navigate and knit for miles and miles…. miles of roads and miles of yarn. Anybody up for a KAL? I’m hoping you will knit Stateline with me. This is a brand new Plucky pattern for a crescent shaped shawl, worked in your favorite worsted weight yarn. There are lots and lots of ways to knit Stateline. It is stunning when knit all in one color, but it is also a perfect “Mix Those Bases” project! 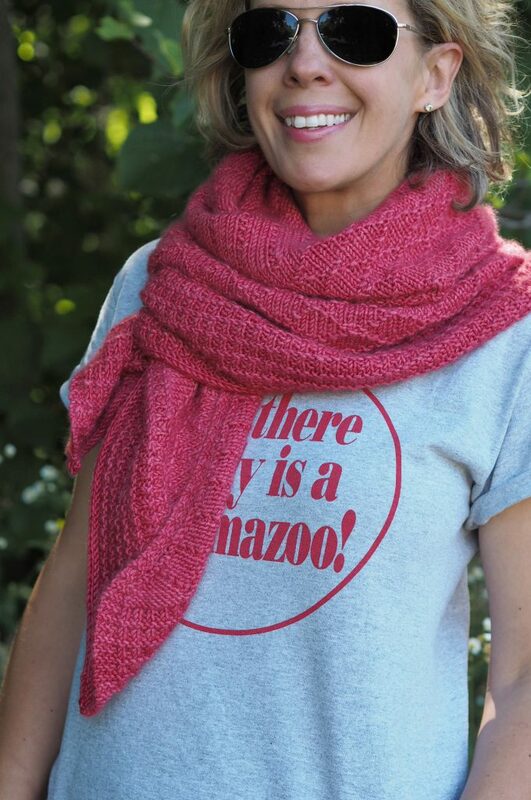 And, the pattern even offers three different cast off methods, letting you choose between an I-cord, a picot edge or a simple elastic bind off. If you would like to join our KAL, all you need to do is purchase the pattern and share your knitting progress! The solid version of the Stateline wrap uses four skeins of your favorite Plucky worsted weight yarn. For the multi base/color wrap, you need one skein for the first band and two skeins of each for the second and third band – so 5 skeins total. You might already have the perfect yarns in your stash. But, if you’re not able to stash dive for everything you need, please keep an eye on the Plucky Reserve shop as I will be loading in some skeins for you to choose from and build your own Stateline kit! Just a note: Personally, I think the following bases will get you the best FO. Snug Worsted, Cachet, Primo Aran, Scholar (either version) or Traveler Aran. Though, please feel free to use other bases such as Bello Worsted, Primo Worsted, Lodge Worsted, Trusty, etc. They will be lovely! Just not quite and fluffy/woofy/squishy as those suggested above. Let the planning begin! I’ll cast on for my Stateline at the crack of dawn on Monday. And, I will be sure to post lots of progress photos as the miles fly by. And I’ll be sure to use the hashtag #pluckystatelinekal and #roadtrippinwithplucky (remember that one?!). But, did I forget something….? Yes. PRIZES! Let’s have KAL prizes! We will open an official STATELINE KAL thread, where we can all post our progress photos and chat like crazy about our projects. When you set up your Stateline project page in Ravelry, please use the tag “pluckystatelinekal”. And, don’t forget to use #pluckystatelinekal on any Instagram photos. This is going to be so much fun…. it will be like we are all on this adventure together! On August 31st, we will randomly choose winners. Whether you are finished or not, as long as you have tagged your project page or an IG photo, and the pattern is in your library, you could win a pretty awesome Plucky Prize. 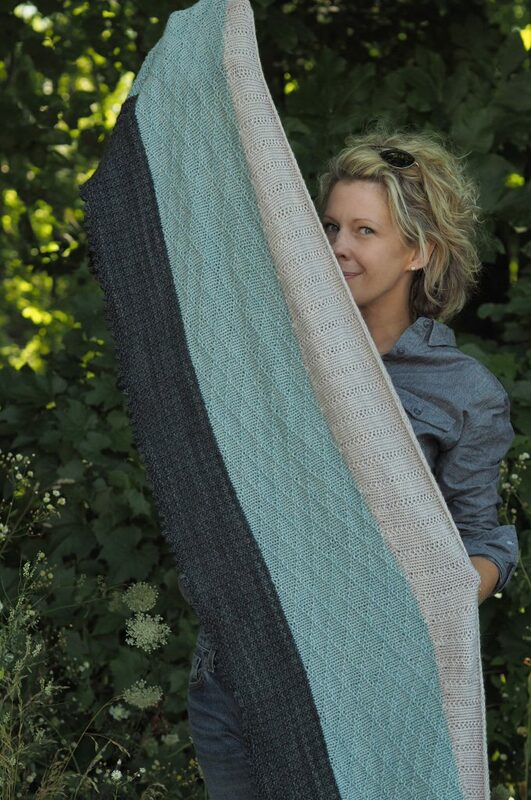 And, let’s have a grand prize for the first person to post a photo of their finished Stateline in the KAL thread! I am delighted to have you all on this road trip with me. Anyone have any favorite audio books?